Despite the title, Maggie Rogers' Heard It in a Past Life provides a snapshot of life in America today. The past is past, the present is hard to define, but the future is coming, and it just may be awesome. 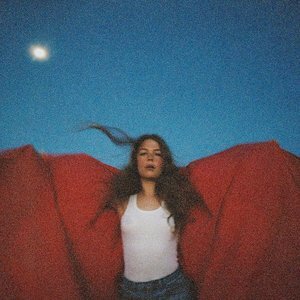 Maggie Rogers doesn't know who she is on her debut full-length release, Heard It in a Past Life. The dozen self-penned songs reveal she's consumed by questions of personal identity, but she doesn't want to commit to being any particular self. That is due in part to Rogers' backstory as a Pharrell discovery and YouTube sensation based on a class project at New York University. This major label release is prima facie evidence that she is now fully-formed. People will form opinions about her. She doesn't want to be pigeonholed as anything in particular based on this recording. That makes sense. Thus, Rogers' persona varies from track to track even as she sings in the first person. This creates some lyrical tensions as the confident crooner of one cut can be the scared introvert of the next one. She professes "she'll never change" on one song and acknowledges "people change overnight" on another. Rogers has a distinctive voice that doesn't alter much from song to song, even when who she professes to be is someone new and different from the track before. This can be best understood as displaying different aspects of the same individual, but it doesn't quite come across that way. Rogers takes an angular approach to her vocals with definite starts and stops to her phrasing. If she stretches out a word for effect, it generally falls into the middle of a line. Her singing provides the album's highlights. The instrumentation and production only serve to accent her voice and sadly often detract from the experience. Songs such as "Say It" and "Retrograde" get engulfed by synths and sound effects that interfere with the lyrics' emotionalism. The cuts are best appreciated if one can hear them inside one's head stripped of the sonics. Rogers offers strong performances that get buried in the mix. Part of the onus is on her as the general production elements reflect her desire. Rogers doesn't want to sing naked because she is unsure of who she is. Rogers constructs a musical platform from which to make her pronouncements. When the arrangements put Rogers' voice in the forefront, as on "Fallingwater" and "Light On", the songs are brighter. She sees the good and bad around her. Unfortunately, Rogers more often finds the world a dark place. Some of us would consider that realism. Rogers may not get particularly political ("Give a Little" was reportedly inspired by the nationwide school walkout in protest of gun violence), but there's a shadow hanging over the album that seem borne of living in America today. But Rogers' concerns are more one-on-one. She's looking for love, but she can't fall in love because she can't really trust another person. Or she can, but then she can't. She's trying really hard to, but she thinks she shouldn't have to try. These are the problems of living too much inside one's head. Rogers thinks too much. She knows that. So she hasn't found true love or a perfect mate. It's not the end of the world. On the confessional "Back in My Body" Rogers confronts her fears and wins. It's a triumphant ending to the disc and suggests Rogers inherent optimism. Despite the title, Heard It in a Past Life provides a snapshot of life today. The past is past, the present is hard to define, but the future is coming, and it just may be awesome.